• For quantitative determination of creatine and evaluation of drug effects on creatine metabolism. • CREATINE is present in vertebrates and helps to supply energy to muscle. 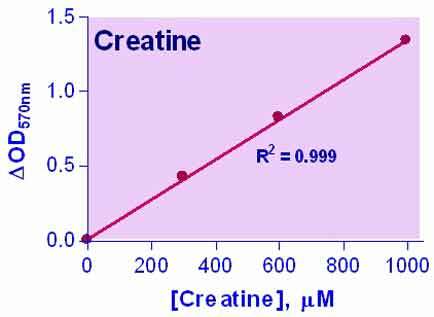 In humans and animals, approximately half of creatine originates from food (mainly from fresh meat). Creatine supplementation has been investigated as a possible therapeutic approach for the treatment of muscular, neuromuscular, neurological and neurodegenerative diseases. Simple, direct and automation-ready procedures for measuring creatine are popular in research and drug discovery. BioAssay Systems creatine assay is based on enzymatic reactions leading to formation of a pink colored product. The optical density at 570 nm or fluorescence intensity at λ ex/em = 530/585 nm is directly proportional to the creatine concentration in the sample. 1. Can this kit be used to measure creatine concentrations in cells? Yes. To determine intracellular creatine concentrations, harvest cells (0.1-2 million cells per assay) in a 1.5mL tube, centrifuge 1-2 min at 3,000 rpm on a table centrifuge. Remove culture medium, wash cells quickly with cold PBS. Immediately remove any PBS. Prepare Working Reagent. Add 120 ?L WR directly to the cell pellet and 80uL WR to standards in 96-wells. Vortex cell sample tube 1 min, incubate 30 min at room temp. Centrifuge 5 min at 14,000 rpm. Transfer 100 ?L supernatant to 96-well. Read OD570nm on a plate reader. Notes: 1. cell number. It is prudent to run several doses of cells, e.g. 0.1, 1, 2x106 cells to determine optimal cell number to be used in subsequent assays. 2. Working Reagent should contain a lysis reagent. BioAssay Systems will supply this reagent upon request.